Modulift has upgraded its compression test rig (known as CTR1), adding 50% additional capacity to the now 1,650t machine. This is the second time Modulift has upgraded the rig it originally manufactured in 2003 for testing 600t capacity spreader beams to a proof load of 660t. In 2012 it upgraded CTR1 so 1,000t beams could be tested to 1,100t, while 1,500t beams can now be tested to the new capacity following the latest three-month retrofit. This was by far the most extensive engineering that the rig has been subjected to in its lifetime. Sue Spencer, technical director, explained that the first upgrade was “not particularly major”, recollecting the replacement of a small number of components and strengthening of others. However, the latest project involved approximately 60% of the rig being replaced with new components. Upon completion of a beam’s manufacturing process, it is placed into the test rig and pinned into place at each end. A compression load is then applied to the pin at one end, whilst supporting the pin at the other. The drop links are then tensile tested separately in their own test rig, also located at Modulift’s facility. The on-site tensile rig can test drop links up to 50t capacity, while independent test houses have conducted tests on Modulift’s behalf up to 825t. Modulift keeps the machine outdoors because of dimensions that now accommodate 28m-long beams. CTR1 comes into its own at the extremities of its capabilities where advantages over staging live tests using a crane and other rigging equipment are most apparent. Spencer concluded: “Traditional beam designs with fixed lugs welded at each end [without separate drop links] cannot be tested in our rig as applying an axial load will not fully mimic all the forces that are going through the spreader beam in real situations. 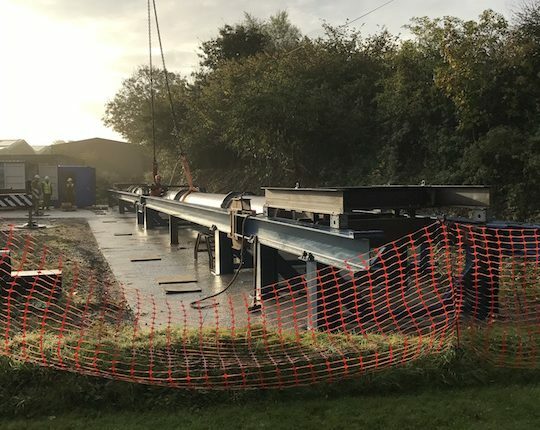 This type of fixed end spreader beam will experience induced bending moments and would need a live lift with a crane and weights to test them properly.